Should You Even Have a Facebook Page? Any of these things can change, of course, as we’ve seen Facebook make changes over the years, but also many marketers are abandoning Facebook, which may cause Facebook to rethink point #2. I have several tabs for my Facebook page, so I had to re-order the tabs. If you need to do that, click on the “More” tab on the far right for a dropdown menu. Choose “Manage Tabs” where you can add and remove tabs or drag them to re-order. Since photos are significant for social sharing, I made the Instagram tab the very next one after “about”. 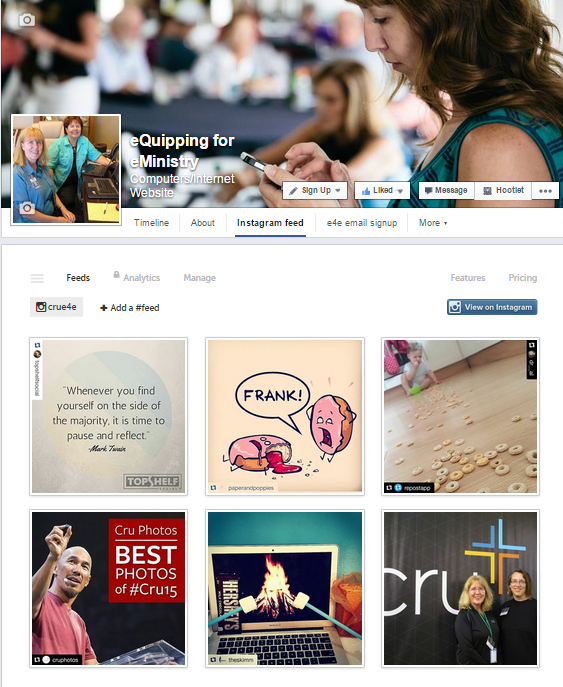 Share your Facebook page with its Instagram feed in the comments. Yes, e4e is now on Instagram. I’ll write about that in an upcoming post. Follow Crue4e. Kissmetrics has a good defense for why marketers should re-consider their decision to abandon Facebook.